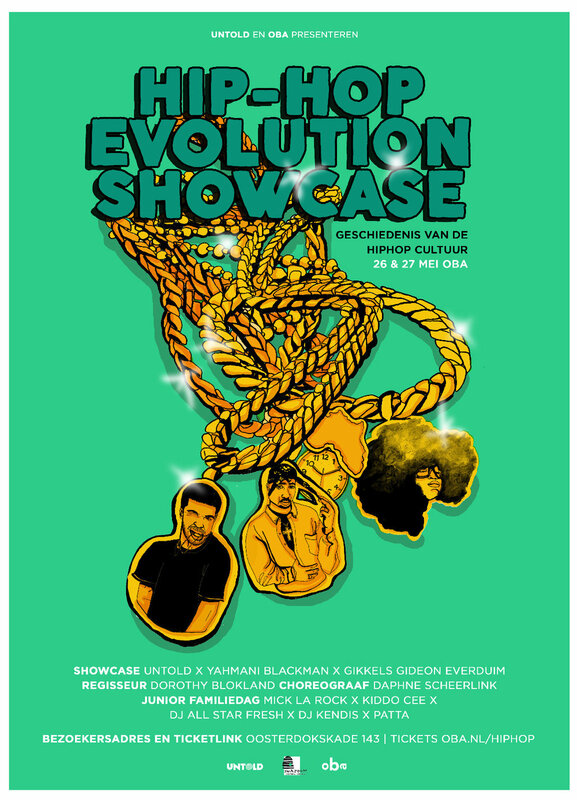 In de Hip-Hop Evolution Showcase at OBA the story of the voyage hiphop has made will be shown by means of urban dance theatre, storytelling, spoken word, rap, dj-ing, beatboxing, breakdance/bboy-ing and graffiti. SMIB x BLAKA will kick off the showcase at the Hip Hop Forum with a panel-audience discussion about the African roots of Hip Hop and contemporary Hip Hop slang. Workshops for kids 6+ with Dutch Hip Hop Royalty like: Beatboxing with Andre Accord, Shirt customizing with the world famous PATTA, De rappende voorlezer KiddoCee will read children's story from books for the little ones, The legendary DJ Allstar Fresh, DJ Kendis & Rockefellababe will spin the 1's and 2's in the silent disco, Breakdance with pioneers The Rocking Chairs and last but not least kids can draw graffiti on NYC subways with Mick La Rock. At 15:00h a junior version of the Hip Hop Evolution Showcase performance.